The abstract for this year's Lunar and Planetary Science Conference are now online. LPSC is one of the largest planetary science conferences of the year, along with DPS in the fall and AGU in May and December. 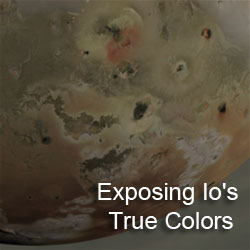 This year's Io posters will be a diverse bunch with mission concepts, geologic mapping, and plume modeling, and statistical analyses of Io's landforms on display. The first LPSC abstract I want to discuss here is titled "Argus: A New Frontiers mission to observe Io" by Nicholas Borer et al. This poster will present a mission concept developed by participants of the 20th Annual Planetary Science Summer School last year. This concept was previously presented at DPS and was briefly discussed here. 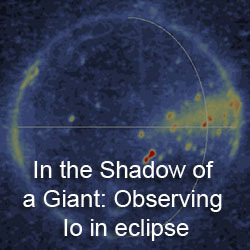 The Argus concept shares many similarities with the Io Volcano Observer. 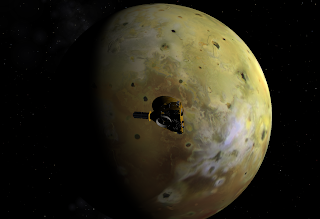 Like IVO, Argus would orbit Jupiter and would perform repeated flybys of Io to answer the mission's science questions. 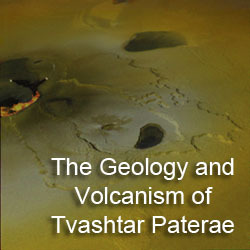 These science goals include investigating Io's geology, geochemistry, and atmosphere as well as the process of tidal heating. However, because of the increased cost cap that a New Frontiers AO would afford it, Argus would be able to perform an expanded mission at Io compared to IVO. For example, Argus would fly by Io around forty times over a two-year period, acquiring 6.8 Gb of data each flyby (which is actually only 1/3rd of the planned per orbit data return of IVO, but then again, IVO's orbits at their shortest are three times longer). This would follow a nominal September 2018 launch and a five-year, VVEGA interplanetary trajectory to Jupiter. The instrument payload seems similar to IVO, though Argus would have a Near IR spectrometer for surface compositional measurements and a UV Spectrometer to map the Io Torus and measure the composition of Io's atmosphere and volcanic plumes. Because the magnetic field environment at Io is not a priority for Argus as it is for IVO, Argus doesn't have a magnetometer suite in its concept payload. Another note about the instruments: BEST...INSTRUMENT NAMES...EVER!! I mean, come on, I-SPI for the visible imager!! CheESE for the near-IR spectrometer! I used to be good at coming up with acronyms. When we were first describing the circular features on Titan that may or may not be impact craters, we needed a term for them that wasn't based on structure since all we saw were near-IR albedo. Zibi Turtle, one of my supervisors, came up with Suspisciously Circular Features (SCFs). Mine was Circular or Round Albedo TERains or CRATERs. Hers was accepted because mine was a bit...too clever. The acronyms for the various instruments seem so creative that I wonder how much time they actually spent sitting around, coming up with acronyms (TIRIMISU, LIME, and SUSHI for the thermal imager, the Ion and Neutral Mass Spectrometer, and the UV Spectrometer, respectively, for the other instruments). My main concern for this mission is that they used planned heritage from the radiation shielding of Jupiter Europa Orbiter to provide cost savings for the mission to keep it below the New Frontiers cost cap. I guess the other concern would be when this could launch. The next New Frontiers AO will not allow radioisotope-powered missions, only solar-powered ones. While the concept doesn't say what the power source is, the high radiation dosages this mission will receive would seem to preclude solar panels. The abstract does refer to the need to have the spacecraft in safe mode for battery recharging during much of the cruise period of each orbit. Maybe they want to have solar panels that will charge batteries for each flyby, but will then be inactive during the flyby. Not sure how that would keep the panels from being fried by Io's radiation environment. So, assuming it uses radioisotopes for power, Argus would have to compete in the next New Frontiers AO, where it would then have to compete against Argo, a flyby mission of Jupiter, Saturn, and Neptune.